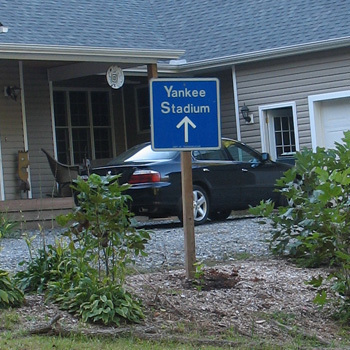 The sign was stolen (using bolt cutters) from the Cross Bronx Expressway in 1987 and has gone up in front of my house every year since 1991 that the Yankees have gone into the playoffs. Yes - I have been seen tearing it out of the ground at midnight and dragging it back into the garage on several occassions... Does the NY DOT read Drawger? Yo - it was ME, and now you know where I live! Go Yanks! THAT'S why I get lost every time I go to Yankee Stadium! I always end up in an area that I prefer NOT to be in. Right on, Ad - When I lived in Oakland (The Billy Ball Years) I was down there all the time - but Yankee Stadium won me over when I moved to the big East. A's and Twins? - I dunno, we'll see... I got HD TV now - so you won't hear from me much until November!